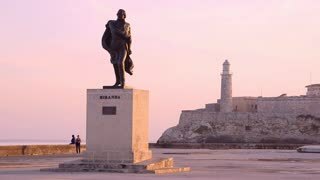 A high angle stationary establishing shot of traffic and pedestrian activity along the shoreline of Havana, Cuba at sunrise..
A high angle stationary establishing shot of traffic and pedestrian activity along the shoreline of Havana, Cuba. 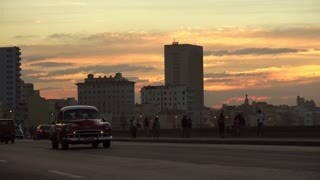 A high angle panning establishing shot of traffic and pedestrian activity along the shoreline of Havana, Cuba. A daytime exterior establishing shot of traffic and pedestrians near Havana Port Bay.